‘Cooper’s Curry’ is a tea that took a ridiculously long time to take from basic concept to actual blend. Ages back, we’d added ‘Bad Wolf’ to our array of Whovian teas. This presented us with an odd problem. We have gift sets of our teas inspired by the Whoniverse, split between green teas and lack teas. Due to our innate sense of fairness – we wouldn’t want to short lovers of either sort of tea – we had decided to keep them balanced. For every black Whovian tea, we wanted to have a green. ‘Bad Wolf’ kicked the blacks out ahead of the greens – which meant we felt we needed to make another Who-inspired green tea. Greens are still a learning process for me. They have been a part of my life and flavour palette for a far shorter timeframe than black teas, so initially I was fairly tentative about working with them. Mister Tea and I had many conversations about how to go about creating another green tea inspired by that particular universe. They ranged over the decades of material the show offers, touching on various companions, doctors, and even some of the iconic alien races created for it. Eventually, we realized that Captain Jack Harkness was definitely a character we wanted to salute. The idea of a sweet curry tea came out of brainstorming ideas for him. 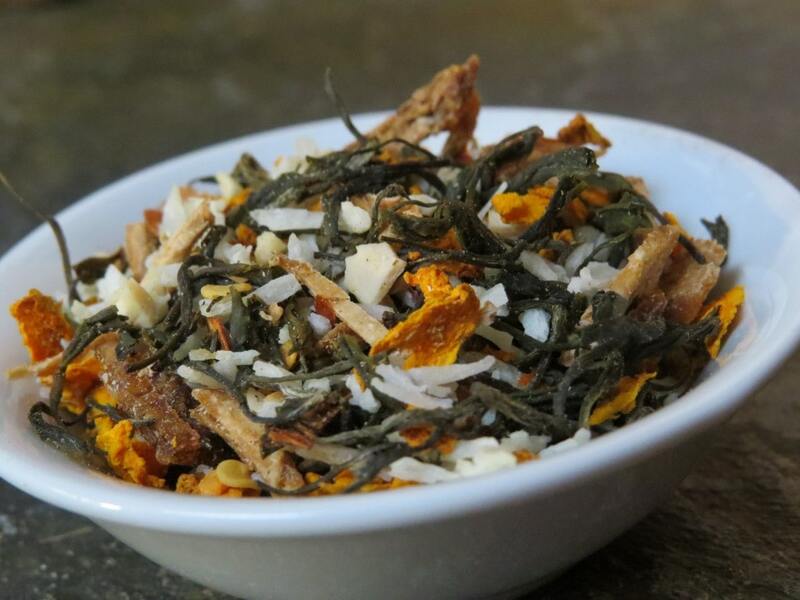 In order to do this properly, we had to add new ingredients to our tea toolbox. There was much experimentation, though, to our surprise, no injuries were incurred in the pursuit of this particular tea. After figuring out how we wanted to go about dealing with the cumin and cashews I had decided were necessary for the taste profile I was aiming for, I set to blending the tea. There was a bit of trepidation, because sweet curry tea? Definitely nothing I’d ever seen before, and I knew there was a chance that we’d try it, eyes would cross in confused refusal, and the test blend would go into the compost bin, never to be spoken of again. The taste test cured all anxiety regarding the oddness of the concept. We loved it. It has actually become one of Mister Tea’s favourites, and he becomes quite bereft when our personal stock of it runs out. To our sadness, it wasn’t a tea that suited Harkness. Not nearly brazen enough, and upon reflection, a tea for him would need to have a more sultry resonance. However, the particular blend did suit itself rather well to a woman who worked with Jack in Torchwood – and had a deep and abiding love of curry. So, we present ‘Cooper’s Curry’ – a salute to Gwen, and an example of my apparent desire to make All The Tea Flavours. 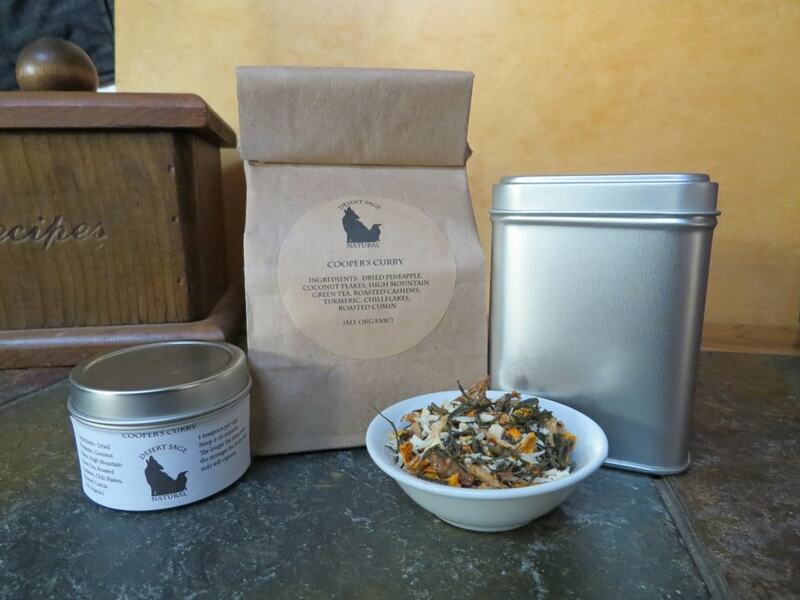 *Our LatchTin is a larger tin with a better seal that holds multiple batches of tea. In this case it holds two. If the teabag option is selected, there will always be overflow – which we send in a vacuum sealed bag. We also offer vacuum sealed refills for our LatchTins. In the case of ‘Cooper’s Curry’ this set of options is only available in our personal shop. This entry was posted in Fruit, Green Tea, Nuts, Simply Tasty Teas, Spicy/Hot and tagged Desert Sage Natural, Doctor Who, Doctor Who Tea, Fair Trade Green Tea, Geek Tea, Green Tea, Organic Cashews, Organic Chile, Organic Coconut, Organic Dried Pineapple, Organic Green Tea, Organic High Mountain Green Tea, Organic Roasted Cumin, Organic Turmeric, Sweet Curry Tea, Torchwood, Whovian Tea by DesertSage. Bookmark the permalink. Impressive amount of work goes into your teas. This one was particularly interesting, as we had to figure out the best way to deal with the cumin and the cashews. So, for this tea, we end up dicing the pineapple, chopping the cashews, grating/dehydrating the turmeric, and roasting and grinding the cumin. Which, now that I put it into a sentence, sounds like an awful lot of work.